The call of nature is something that we must all be ready to deal with in our lives. Every baby will in a day have three to five peeing or pooping sessions. When traveling with your baby, you will have to take an emergency stop for your baby to relieve herself. When taking your baby to poop or pee, you will probably have to visit a public toilet. 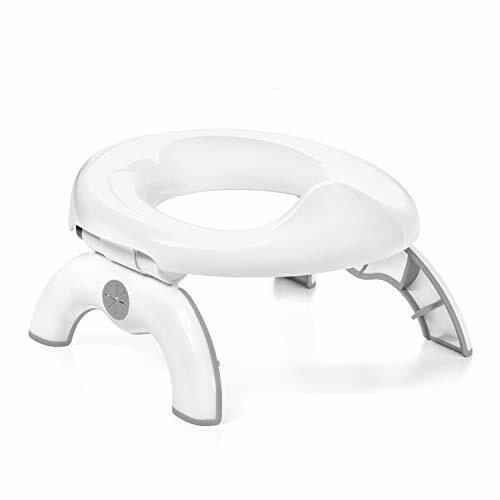 Without the best travel potty seat, your baby will have to sit on the contaminated toilet seats.With a travel potty seat though, your baby will sit on the public toilet seat comfortably and relieve herself without any hiccup or come into contact with any harmful germs. Having the best travel potty seat will be of great advantage as you will enjoy your travel time with your little one without any challenges.Finding the best travel potty will nonetheless depend on your ability to be keen when choosing one. Lucky for you, we have provided enough information for you to have one of the best for your baby. 2 in 1 on-the-go potty. If you need to be prepared for any emergency as your travel, OXO TOT 2-in-1go potty for travel is the right one for you. The main reason why it is fit for travel is its ability to quickly open so that it can provide room to be used as a standalone with disposable bags, or as a potty seat to be used in a public restroom. 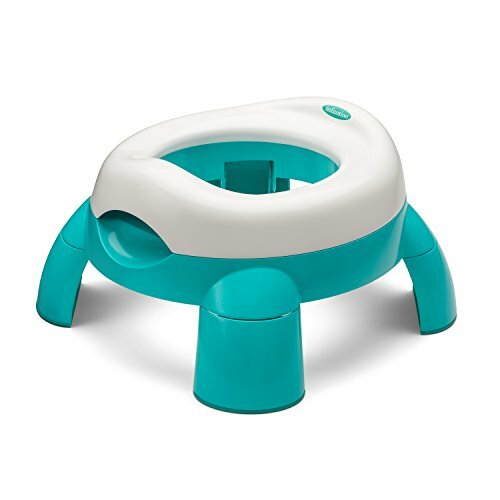 When using this potty as a standalone, the legs will securely lock in place giving a firm seat for your baby. It also stands at an ideal height for your growing baby. On this potty are flexible and soft flaps that will hold the disposable bags securely in place. To quick start things for you, three disposable bags with absorbent pads alongside refills are included. When using this potty as a toilet seat in public washrooms, its legs will fold outwards leaving non-slip grips which keep the potty stable on the elongated or round toilet seats. To ensure that it is convenient and sizable for your baby, it is small sized and can prevent spills or splashes. What’s more, this is a two in one on the go potty. It will really serve you and your bundle of joy very well. The only issue to be worried about when using this potty is that the hole and the splash guard are somehow small. Opens quickly and easily for on-the-go emergencies. Legs fold into a compact smaller potty for storage in cars, strollers or diaper bags. Legs lock securely to be used as a standalone potty. The legs will fold outwards to be used as a toilet seat in public toilets. It has flexible and soft flaps to hold the disposable bags securely. They come with three disposable bags. The hole and the splash guard are small. 4 Pieces of large non-slip silicone pads. A fold and unfold switch design. Toilet cover seat and Standalone seat. Support babies of 12 months and up to 60 pounds. Is your bundle of joy still undergoing the training on how to use a toilet properly? This potty will suit her very well. 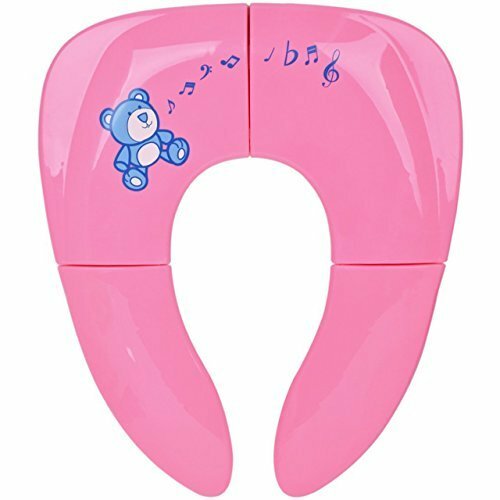 It is made to help children learn how to use the toilet bowl with a lot of confidence. It will help as you travel as well; you will use it to cover public toilet seats preventing your child from coming into contact with germs. This will make sure that your baby does not contract any unwanted diseases. This potty is foldable and portable making it a suitable replacement for a potty chair during travel. This upgraded version comes with 4 pieces of large non-slip silicone pads, which increases the area of contact between the toilet cover and the potty training seat. On this potty, there are no gaps hence your baby will have a perfect time without being pinched. This potty can be switched from the foldable to the unfoldable design to allow use in public restrooms and away from home bathrooms. What’s more, its owl design will attract your baby to use it. The only negative issue regarding this potty is that the red eye decorations will easily come off after being used 2 or 3 times. This will make it become unattractive to babies after a short while. It has 4 pieces of silicone pads which increase friction between the cover and the toilet seat. It has no gap. Therefore, your baby will not be pinched while using it. It can freely switch between the foldable and the design that cannot be folded. The toilet seat cover is 7’’ long by 6’’ wide by 2’’ high making it suitable for public restrooms. The unfoldable design covers 13.5’’long by 11’’ wide by 1’’ high which makes it perfect for everyday training at home. The red eyes decorations come off after 2 or 3 uses. Has 3 easy usage steps. Support children up to 50 pounds. This is a simply designed potty that will give you a piece of mind while traveling. It can be well used by following three easy steps which include unfolding the legs, placing the gibe over the base and placing the seat over the base. It also has a comfy seat that your baby will sit on without any difficulties. To make things easier for you, it comes with 6 disposable bags and travels storage bags. You shouldn’t be worried when your baby is using this potty because it has a splash guard and back support. The back support will also give a comfortable seat as your baby does her thing. What’s more, it is also very lightweight so carrying it around while you travel will not be an issue. It is also capable of supporting children weighing up to 50 pounds. The only drawback of this product is its small hole and a height that is not ideal for young ones. Features 3 easy steps, this will make sure that you can use it with ease. You will be required just to unfold the legs, place the gibe over the base, place the seat over the base and then pack it in the bag. It comes with 6 disposal bags and travels ready storage bags. It is suitable for a family on the go to avoid dirty toilets. It has a small hole, and the height is not ideal for young ones. 4. ONEONE Portable Travel Potty Urinal for Boys and Girls. Measures 9.8 inches by 4.1 inches and a hole of 9 inches in diameter. This is a portable potty which will be a great potty for traveling anywhere you will be with your baby. You baby girl will be required to sit on it and pee, for boys, they can stand before it and pee after which you can ensure that the lid is fully shut before carrying it away for storage or disposal. What makes this potty great is that it can be rinsed by using tap water, and it will be as clean as a slate. It is of a perfect size of 9.8’’ by 4.1, ’’ and the hole has a diameter of 9 inches. It is colorful to ensure that your baby loves using it hence succeeding quickly in training your baby to use the potty. What’s more, it is light in weight making it easy to carry as you travel. It is also made of eco-friendly PP material which makes it safe for both your baby and the environment. The only issue to be worried about when using this product is the fact that it is somehow small for some kids. It is light in weight making it easy to carry and ideal for use when traveling. Made of eco-friendly PP material. Colorful design is proven to encourage successful training of children. It is easy to clean, as part of it can be disassembled and reconnected back. It is small for use. Steel ankles at the joints. Withstand a maximum weight of 20Kg. Are you looking for a strongly designed portable potty seat? This is such a potty. It is designed with large amounts of strengthening ribs, so you will need not to worry if it will get deformed when bearing the weight of your little one. The joints are connected with a steel axle which is anti-rust and very sturdy. On the bottom of this potty are wear-resistant anti-slide pad cans which prevent the potty seat from moving around. This will make sure that your baby is kept baby steady from falling into the toilets seat. It has a regulating button which is used to keep the potty seat in its intended position. This potty seat is made of polypropylene which is a durable material. The design is foldable and can fold into a unique style making it good for travel and away from home use. Your baby’s hygiene and safety are covered with this best travel potty seat. It is also washable with soapy water. This seat will perfectly suit most public toilets. However, it will not fit those with U-style and elongated ones. Its design which permits it to be folded makes it portable and suitable for travel. The polypropylene material is durable; this will make the potty to last a very long time. It has 2 non-slip rubber padding and locking mechanism which keeps children safe. Can fit every standard toilet. It is flimsy and has gaps which might pinch the baby while using it. Toilet seats for little ones are good for hygiene and creating convenience for them to relieve themselves. It is therefore vital to purchase the best travel potty seat for your baby when you are planning to be traveling soon. 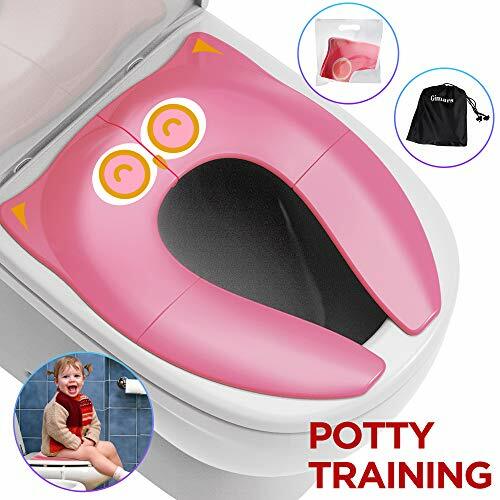 While all the products that we discussed above are great products, we would like to recommend the OXO TOT 2-in-1 Go potty and potty seat for travel which is a multi purpose potty seat both as a standalone and toilet seat. It is for this reason that it will best fit your baby. As a standalone, the legs of this seat will securely lock in place giving a firm seat for your baby. It also stands at an ideal height for your growing baby. On this potty are flexible and soft flaps that will hold the disposable bags securely in place. When using this potty as a toilet seat in public washrooms, its legs will fold outwards leaving non-slip grips which keep the potty stable on the elongated or round toilet seats. Splash guards are the essential parts of any potty seat. Kids struggle controlling their bladders when peeing or pooping. So it is important to have splash guards which will prevent the splatter from hitting your baby’s clothing. READ Top 5 Best Baby Car Mirrors Will Keep You Focused On Your Driving! It will also prevent the pee from flowing away from the potty. For young girls, it will be hard for them to position their pelvis rightly hence messing the whole place will be a probable effect as a result. With splash guards, this will seldom happen. Instead, the number one or two exercises( pooping or peeing) will go well. Stability is one key factor of avoiding messy situations. To ensure that your baby doesn’t topple over, the potty seat should have paddings that will minimize movement. This padding should have soft and tight paddings that will increase the friction between the normal seat and the potty seat. This will give your baby a stable peeing or pooping moment. It is good to confirm the stability of your baby’s potty seat by using both your hands. Place the right and the left hand on the potty seat and try to move them aside. If it remains stationary even when you try to move it, then the potty seat is stable. As you hunt for the best travel potty seat, it is important to see the ability of the potty seat to be converted into a standalone seat or a potty seat. Those that can be converted into standalone seats have flaps that can hold the disposable bags. They have foldable legs which can either fold away to give room to be used as toilet cover seats or can be locked and act as potty seats with disposable bags attached to them. Colorful and decorated baby gears are friendly to children. Babies like using things that cajole them into using them. You should ensure that your baby’s travel seat is at least colorful to make sure that your baby falls in love with it. This is to avoid an emergency situation where your baby may want to go and relieve herself when traveling but does like using the potty you bought her. The material used to make the potty seat is very important as they will keep your baby safe as they sit on it. Some seats deform when your baby sits on them. One of the best things you should consider when buying your baby’s travel potty seat is the weight ratings. Materials like polypropylene are always the hardest and are unlikely to deform when your baby sits on them. There are two different kinds of travel potty seats. There are those that are made of pure plastics. They are a little tilted so that your baby’s pee can be channeled back into the toilet if your baby happens to have released herself in different directions. They are also easy to clean and very stable. There are also the cushion potty seats that give the perfect seat for your baby. These are good in a case where your baby is not comfortable seating on plastics. They are however heavier and hard to clean especially when your baby messes them up. Have you ever used any of the best travel potty seats that we have reviewed above? Did you love the performance if you have ever used one? Which one would you love to buy next among the five that we just reviewed? We really value your feedback and would like to read your answers soon. If there is a product that you wanted us to review, but we didn’t, please inform us about it, and we shall consider it next time.